I like it when paintings go out the door and slightly less when they come back. Does anyone remember this series of paintings titled Echoes? I still had a few of them in my studio inventory, and now I have six more. 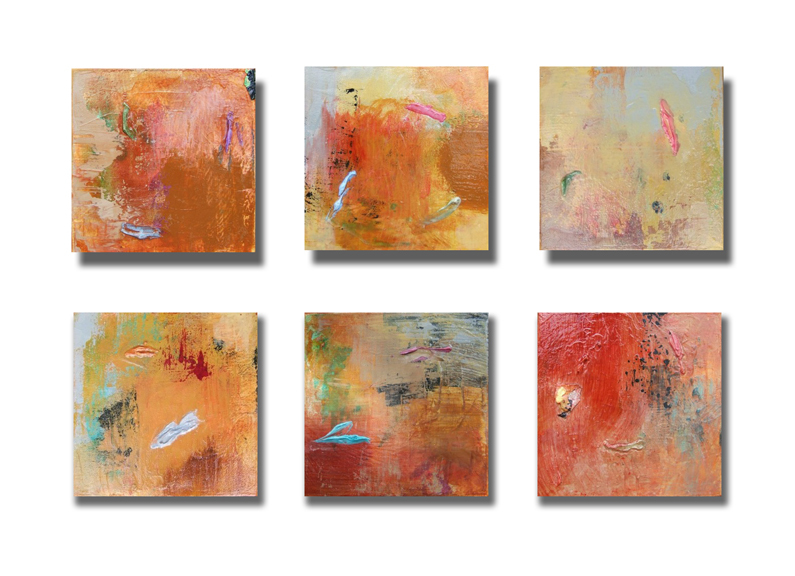 I had sent these six to a gallery to show to their interior design clients, and after two years and a management change they decided to send them back to me. I like them. But what to do with them? Since almost all in this series are 12 inches square, I could just hang a whole wall of them somewhere in the studio or elsewhere in my house. I don’t like having them hidden away. Of course I could look for another gallery, but they really don’t exactly fit with the rest of my work. I have a new website with a new domain name. So now I still have to redirect the old domain name to the new site, but the old one still works for almost another month. Created on Yola.com, the new one is simple and straightforward with the express purpose of being a portfolio to show to galleries and designers. My old one has served me well, but I needed something simpler. Thanks, Cat. So nice of you to stop by. Merry Christmas to you too. I know what you mean by distractions! Lots going on right now, and then my favorite time of the year — right after New Year’s when everything gets quiet for a little while. I would certainly hang these lovely works where you can enjoy them. Love the beautiful cheerful colours. I have bookmarked your new website – Elements 9 is stunning, such great colour contrast. I shall put this one up on my computer for inspiration. Thanks, Sandra! I’m happy you like that one. It happens to be one that was planned and thought about beforehand. Not my usual way of working, as you’ve probably gathered. They are nice, but maybe they might undergo some changes to make them more profound? You have developed in the meantime, why not take them along? Eva, I hadn’t even considered that! Excellent!! You know I’m fearless when it comes to making alterations and additions. Great idea. You’ve got my wheels turning now. one more time, Martha these are lovely – i agree with eva that a bit of that magic touch of yours might add an element of sophistication to them… yes, definately hang them somewhere you can enjoy them. Another idea to consider – with a seriies of 6 paintings (6×6 acrylic on cradled panel) i did last year, not sure how to get them ready for a show, i glued them all on a larger panel which i had painted matte black. Three on top, three underneath. it looked spectacular and sold right away! this series might look good with two panels together mounted on another. More good ideas to consider, Nancy! Thank you. I have actually sold a couple of groupings of paintings that were mounted together on one backing. That has a lot of visual appeal, I agree! Now what if I kicked them up a notch with some added elements? Hmmmmmm. Hi Martha. I love these as they are, especially the hints of magenta and turquoise, but I can just imagine you tackling them again and turning them into somehting new. Either way, they’ll look great on the simplified website. Hope your turkey’s doing well. Thanks for the vote of confidence, Cath. And as for the turkey, I’m watching it closely. It got rather warm out yesterday and it started thawing a little too fast. Now it’s cold again. I’ll probably bring it in tomorrow and begin the brining process, which by the way my son told me I should totally do!! I’ve never brined one and he says it’s the only way to go.